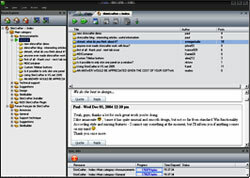 1TOPIX free useful tool for forum downloading/reading/posting in offline mode. ...... After adding a new resource or just particular forum categories you're interested in you can download new posts and read them afterwards. Smart program wizard will guide you through the steps needed for resource creation and info downloading. In 1TOPIX program forum content is performed in multiple tabs view, enabling users to look through information organized in a convenient form. Now 1TOPIX supports the 3 most popular forum engines: vBulletin, phpBB and Invision Power Board. Keep your finger on favorite topics with the aim to obtain the freshest information interesting for you, 1TOPIX detects updated threads showing them on the top of the viewer that simplifies navigation as well. 1Topix enables you to save necessary info from several forums you are registered at and put all forums in tree-view order, exactly as this realized in an e-mail agent. Qweas is providing links to 1Topix 1.0.0 as a courtesy, and makes no representations regarding 1Topix or any other applications or any information related thereto. Any questions, complaints or claims regarding this application 1Topix 1.0.0 must be directed to the appropriate software vendor. You may click the publisher link of 1Topix on the top of this page to get more details about the vendor.